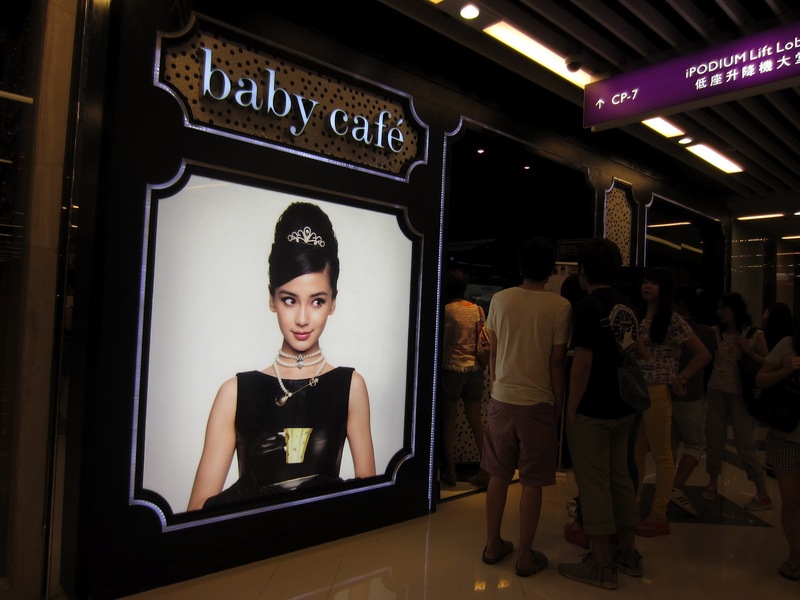 A trend that has been spreading all over Hong Kong in the past year is a trend I so wish would make its way to Vancouver. 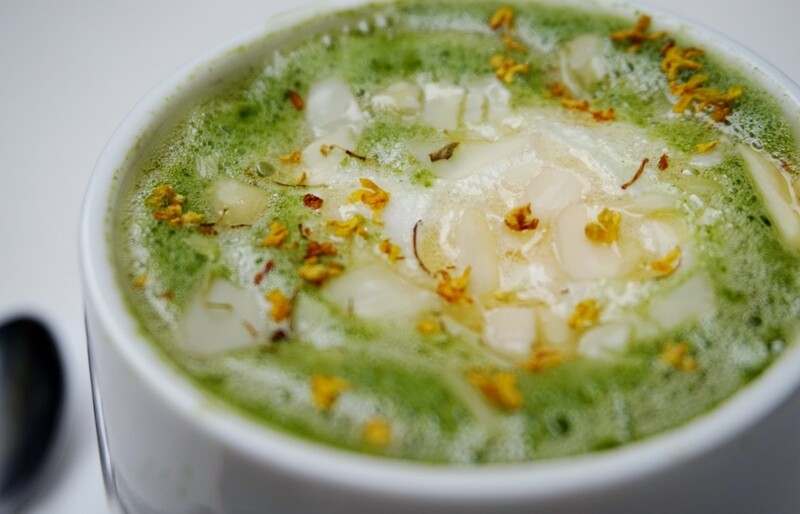 So far there’s only one place that’s caught on and it’s Basho Café on Hastings. Can you guess what the trend is? ….It’s Matcha!! 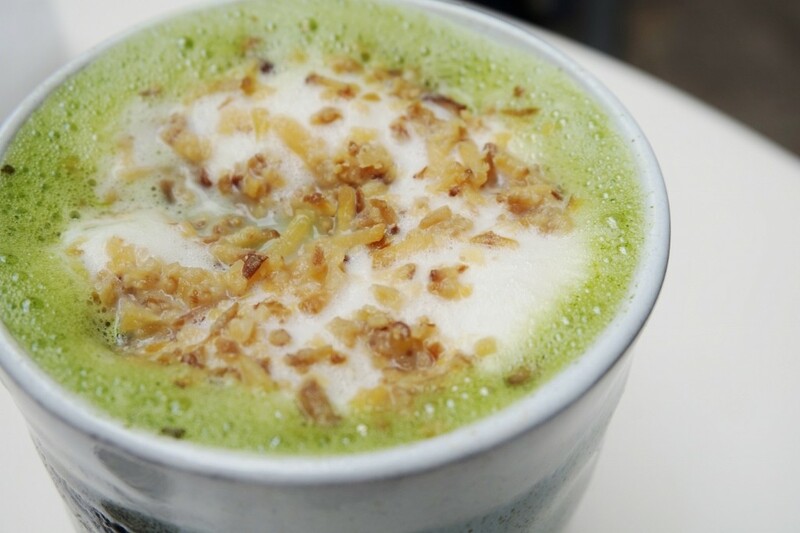 Specifically, cafes that specialize in nothing but Matcha. 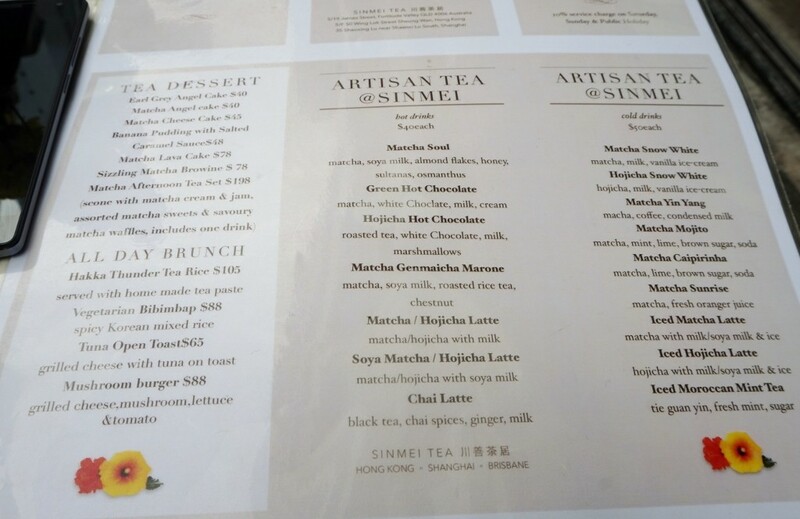 For green tea fanatics like myself, it’s a dream come true when I stepped into Sinmei Tea in HK. Thanks in advance to Trixie for bringing me here! Sinmei Tea is located in Sheung Wan hidden on the 5th floor of what looks like an office building. Once inside however, you will be transported into a quaint, traditional Chinese tea shop. We came during 3pm so we didn’t have to wait but the word is line ups are usually up to half an hour long during peak times. I got the Matcha Soul ($40 HKD/ ~$5 CAD) which is made up of matcha, soy milk, almond flakes, honey, and osmanthus flowers. I was unsure about this drink at first but it was incredibly delicious. The honey added a touch of sweetness to the otherwise bitter matcha and the osmanthus flowers gave it a nice floral touch. I would highly recommend this drink! 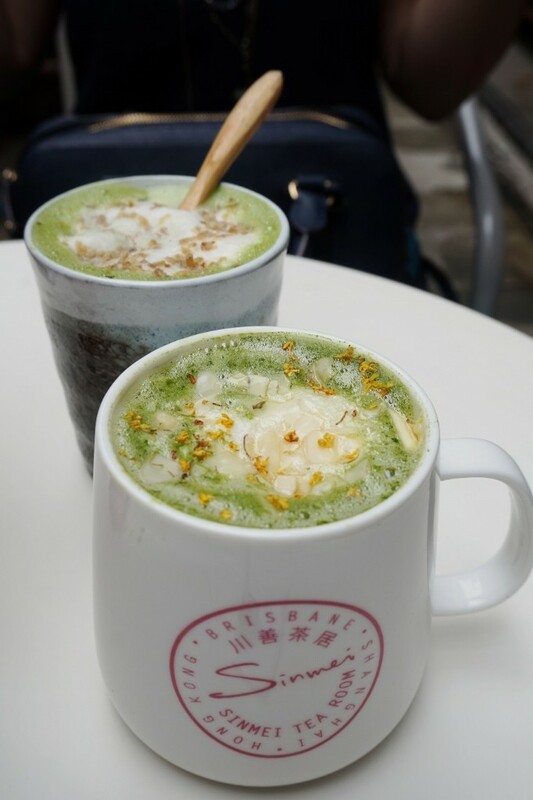 39Trixie got the Matcha Genmaicha Marone ($40 HKD/~$5 CAD) which combines together roasted rice tea, chestnut, matcha, and soymilk. 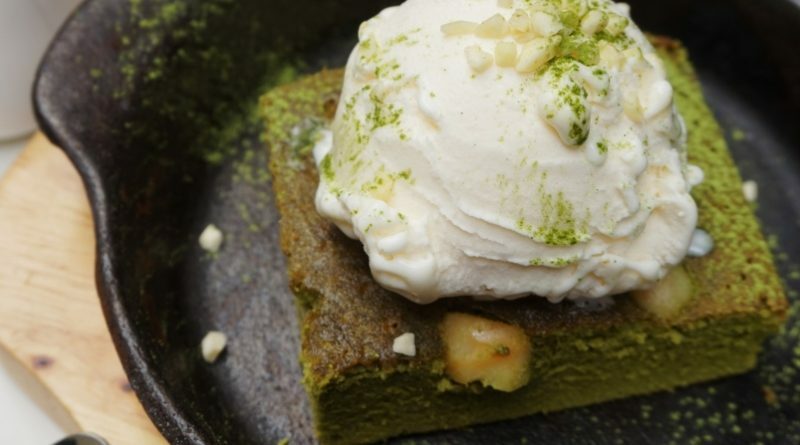 In addition to the drinks, Sinmei is known for their matcha infused desserts. 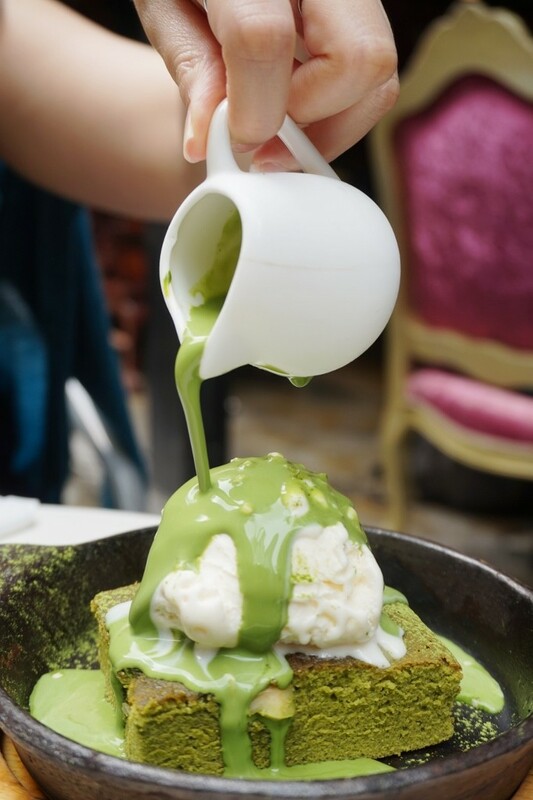 I do have to say though, sipping on the hot matcha drink along with eating all of the matcha desserts kind of gave me a caffeine overdrive. I almost started to feel buzzed and jittery so beware of all the caffeine if you order too much! 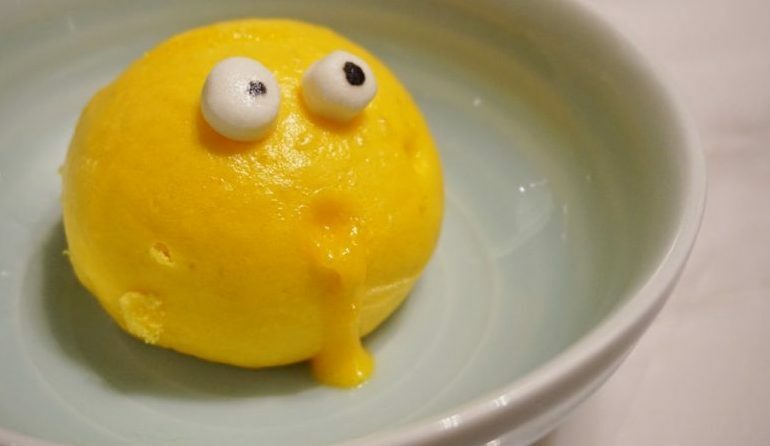 This is the dessert that prompted my visit because I saw it on Instagram first and dreamt about it ever since. 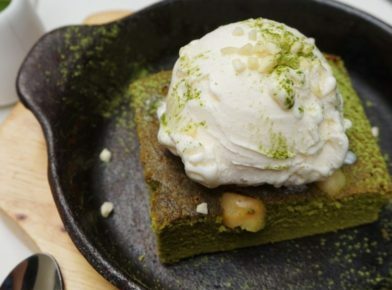 It’s called Sizzling Matcha Brownie ($78 HKD/~$10 CAD). 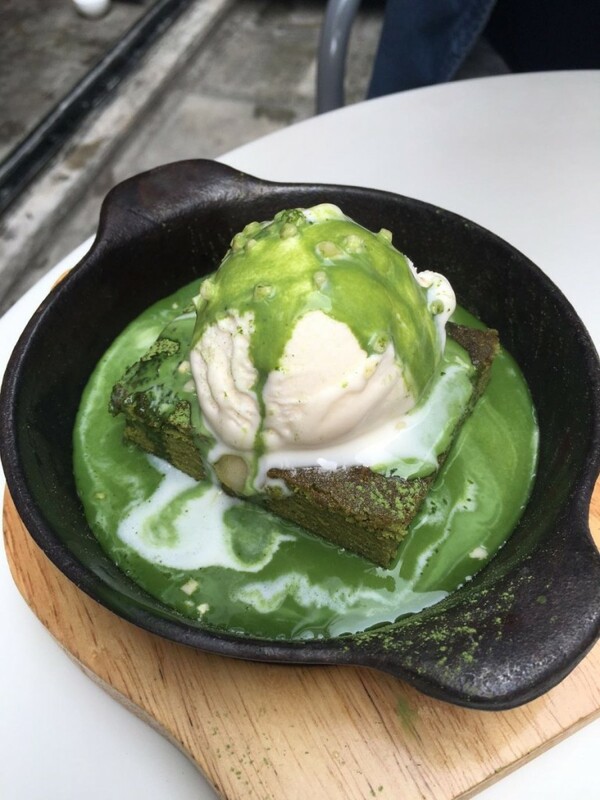 The thick brownie has quite a green hue which leads me to believe it’s a white chocolate brownie infused with lots of matcha powder. In the end we sat here for over 2 hours near the patio chatting and enjoying all of the matcha deliciousness. 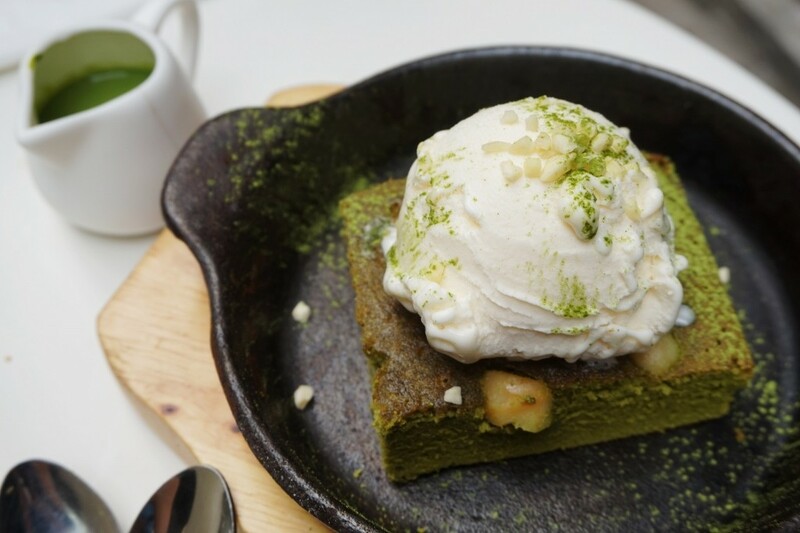 It reminded me of the time we went to another matcha café in Tokyo called Kyo Hayashiya (read my post on it here) but even the desserts there were not as flavourful as the ones here.